People want a fragrance to smell good. Pretty basic. I think that probably second on their list of wants is that they want it to last a decent amount of time on their skin. If you read comments about fragrances on Basenotes or Makeup Alley, it's a complaint you see over and over again: smells good, lasts about five minutes. That's not usually a problem for me. Most scents stay with me for a pretty long time. I don't know if it's because of the scents I wear (lots of dark scents, orientals and chypres, things with plenty of base notes in them) or because my skin just likes to hang onto the molecules, but I find for the most part that even fairly light scents tend to stick with me. There is, of course, the occasional exception, and Vera Wang for Men* is one of them. After the lemony opening tumult (it smells like lemons to me, though the official top notes are green mandarin leaf and the Japanese citrus fruit yuzu), the scent settles down to a nice leathery masculine brew, slightly spiced and bearing a burly overtone of pipe tobacco. It's not anything out of the ordinary, but it's a pleasant, well-done men's scent (in a nice bottle, a clever remake of the women's version). And then, nothing. It just fades away. After less than an hour, I can still smell it if I press my nose to my skin, but that's not what people mean when they talk about lasting power. If six or eight hours after application, I catch a recognizable thread of the scent when I bring pick up the phone receiver, or someone in my immediate orbit can get a pleasant whiff of it, then that's a fragrance with lasting power. 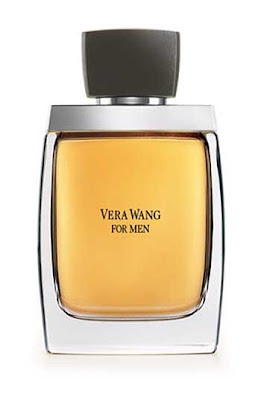 Vera Wang for Men is without a doubt the most evanescent mainstream scent I've ever experienced. There are lightweight, throwaway scents like the Demeter line that have very little lasting power, and I don't expect them to last all day: they're colognes, refreshers, fun little novelties. But a relatively high-end scent has to have some life to it. (Even the light, crystalline Bulgari Eau Parfumée au Thé Vert lasts four to six hours on me.) It doesn't have to be--shouldn't be--overpowering. It doesn't have to last until the next day (though that's always a nice bonus). But it has to be there for at least a few hours, or what's the point? *Liz Claiborne calls her men's line just Claiborne. The women's version of Spark is by Liz Claiborne, but the bottle for the men's version just says Claiborne. I wish Vera Wang had done that, and given us Wang for Men. Yves Saint Laurent's Rive Gauche ("Left Bank") was launched in 1971, a year that was no stranger to offbeat, fascinating women's fragrances: it also saw the enigmatic Aromatics Elixir by Clinique and the sharp-edged iris of Chanel No. 19. Rive Gauche is cool and reserved, a floral barricaded within sharp aldehydes. I don't know what compelled YSL to launch a men's version over thirty years later, unless it was the success of Opium Pour Homme in 1995. Unlike the two Opiums, the versions of Rive Gauche have nothing to do with one another. Where the women's version was strict and rather avant-garde, the men's Rive Gauche is almost a throwback. There's nothing modern about it: it really smells like something from another era, something your great-grandfather might have splashed on his face. After an extraordinarily brief flash of bergamot--it's literally gone within a minute--mixed with gorgeous herbal rosemary and a tiny hint of anise, the scent settles down to a soapy barber-chair concoction of lavender (and lots of it) garlanded with geranium leaves and a dab of patchouli. It smells very soapy: it strongly resembles shaving cream, which, luckily, is a scent that has good connotations for a lot of men and women alike. It's amazingly long-lasting on the skin, as is the base, a simple and durable vetiver-laced wood threaded through with more of that soft, clean patchouli. The bottle--it's actually an aluminum canister--is a duplicate of the women's bottle, in darkest brown instead of sky blue. Rive Gauche Pour Homme isn't ground-breaking: it's not the sort of thing you smell and then have to own, but it's well-made and appealing for all that. I'm starting with a nearly off-topic rant. Feel free to skip down a few paragraphs if you like. What is the deal with men getting waxed and shaved and plucked into a sleek, plasticky, hairless would-be ideal? It's horrible. All men have hair on their bodies. Even naturally smooth men have what's called vellus hair--those tiny, fine hairs that everyone has, even women and children. (The longer body hair that a lot of men have is called terminal hair.) When men wax or shave off their body hair, they don't just take off the terminal hair, they take off everything, and they end up looking artificial--like a plastic department-store mannequin. I don't understand the appeal of a putative man who's as hairless as a mackerel. It just escapes me entirely. Don't they want to look like men? It was obvious from the advertising that Lacoste wasn't trying to sell their new scent to teenagers; they were aiming at a somewhat older, more confident market. The sharpness of the top note lingers for a surprisingly long time before giving way to the middle notes, mostly spices (cardamom, cinnamon, and pepper) softened by balsamic juniper. This gradually fades into a sophisticated base note of woods, vanilla, and musk. 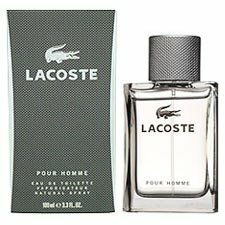 Compared to many men's scents from the last ten years or so, Lacoste Pour Homme is complex and rather elegant--a thrilling change of pace from the usual gamut of fresh and boring. The packaging is also elegant: a deceptive block of pearl-grey glass which actually has softly curved, beveled sides, capped with a gunmetal oval in a beautiful textury pattern. This pattern, the colours, and the curved edges of the bottle are cleverly echoed in the box; it's all beautifully designed. The Perry Ellis scents are a real mixed bag. Some of them are really good; some of them are dreadful. Most of them, as you might expect, are middle-of-the-road: commercial scents which aren't intended to express a point of view or an artistic statement, but to appeal to as many people as possible and make a lot of money. Top: Italian bergamot, lime zest, mandarin, ruby orange, nutmeg, red cinnamon, clove bud. Middle: parsley, coriander seeds, lavender. Base: Mysore sandalwood, red cedar, vetiver, patchouli, oakmoss, musk. The top is a jumble of citrus notes, permeated--polluted, really--with something like calone, a note which is in just about everything nowadays: it gives that ozonic seaside smell that is the universal (in North American fragrances, anyway) signifier for "fresh". Whenever you smell a men's deodorant with a name containing "thunder", "rain", "wild", or anything of the sort, whenever you read of a new fragrance that's "clean", "fresh", "outdoorsy", you're probably getting a snootful of calone or something homologous to it. Do they have to put it in everything? It seems like ninety per cent of new men's fragrances these days--no, make that ninety-five--are fresh scents (just as the huge majority of women's scents, even from established houses that should know better, are fruity florals aimed at a very young market). It's crazy. There are hundreds and hundreds of them on the market right now; is it really impossible to sell people a good oriental, a well-thought-out pure floral, a subtle chypre? Are people such sheep that everyone has to smell exactly like everyone else? I guess I'm done ranting. Once you get past the top of 360 Red, you have a not-bad scent. The synthetic freshness lingers longer that I'd want it to (I'd rather it weren't there at all, of course), but a sneaky warmth begins to emerge as the ozonated citrus notes stop screaming at you. It's a warm, herbaceous scent grounded in lavender, and it smells masculine without being aggressive; it's stripped-down, almost minimalist. The base notes sound like a powerhouse, but they're surprisingly understated; nothing makes a dramatic entrance or dominates the endgame. Just more subtle masculinity, really very pleasant. It's a shame about that horrible top note, which was almost enough to turn me away from the scent altogether. The bottle, of course, is genius. The original women's 360, launched way back in 1993, was packaged in two bottles: the perfume was in a glass sphere (it was divided around the equator, with the top half uncovering a stopper), and the eau de toilette was in a tall glass cylinder with a metal collar and a spherical cap. Yeah, it's unavoidably phallic, but it's also an icon of simplicity, and it pretty much became the house bottle for both men's and women's scents, used not only for the ever-expanding 360 line but also for the extraordinary Perry Ellis Reserve. In the 360 line (which now encompasses the original scent plus Red, White, Black, Blue, and finally, because they evidently ran out of colours, Pure), the men's bottles have a silver collar, the women's gold. The 360 Red bottle is, predictably, red glass, a colour not usually used in men's scents, and it's gorgeous and striking.